You may think the balance you get at the ATM is the most up-to-date representation of your available funds, but that’s not always the case. Here’s why. Even your debts are not automatically deducted from your checking account. This is why it’s important to keep a running balance of your account at all times. When you make a deposit, the bank gives you a credit for the deposit. But in reality, the check is sent to a regional clearinghouse and must clear there before your bank actually receives the money. If the check is from out of state, it may need to be sent to another clearinghouse before the funds are settled, and could take even longer to get to your bank. This is why when you deposit a large check from out of state, the bank may put a hold on it until funds are collected. This protects you from spending the money before you actually get it. And sometimes the check will not clear and you will need to pay the bank back if you have already spent the money. However, there are some ways to avoid a hold if you can’t wait for the money, though these tactics don’t always work. Similarly, checks do not clear your account the moment that you write them and send them off in the mail. Once the person or company receives your check, they must deposit it in their bank and then wait for the money to be transferred from your account to theirs. Checks usually take the longest to clear, and you may have outstanding checks for a month or longer. This is why it’s important to keep complete records of the checks you write, the date, and the amounts, so you don’t forget about a check and overdraft your account. Similarly, debits and deductions don’t always immediately show up in your account. Sometimes, when you use your debit card at a new place, a hold for a small amount is placed on your account. This hold, which is usually a few dollars, will drop off your account in a few days, then the actual charge will show up. When this happens the hold may drop off before the amount is deducted from your account, and your bank account balance would say that you have more than you do. If you do not keep track of your actual transactions, you can end up overdrawing your account. 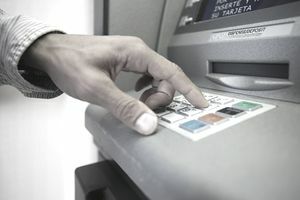 It’s for all of these reasons that you should keep a running balance of your bank account, and not implicitly trust the balance you get at the ATM and assume it’s correct. To keep a running balance you simply record your transactions as you go, then you add and subtract them from your balance in order to get the amount that you really have. You can do this the old-fashioned way via pen and paper or spreadsheet, or many banks now offer real-time apps, such as PNC Bank’s Virtual Wallet, which shows a more up-to-date view of your account. Having trouble keeping a running balance of your credits and debts? Consider switching primarily to cash for your budget. With this type of budget, you will not need to worry about your bank account on a daily basis, but it’s still a good idea to keep a running balance of your available funds to account for things like automatic bill payments and checks written to establishments or for bills that don’t accept cash.